Ghṛta Kalpanā (medicated ghee preparations) is one of the commonly used dosage form in Ayurvedic pharmaceutics. It has four fold aims (i) to dissolve/extract/hold the lipid soluble active therapeutic principles from the plants and minerals, (ii) to make use of therapeutic values of ghee, (iii) to preserve the drug/drugs for longer time (enhanced shelf life), and (iv) to enhance and hasten the absorption of drugs, when used topically in fatty medias.,,Kuṅkumādi Ghṛta (KG) is one such Ghṛta based widely used formulation in therapeutics. Ghṛta preparations are mentioned to have shelf life of 16 months as per Ayurvedic classics and shelf life notification of Government of India. Though no major difference is observed in comparative clinical efficacy of both KKG and NKG, NKG can be preferred over KKG by large scale industries, as it is more cost effective than KKG. Stability is an essential criteria for development of a pharmaceutical product, however, published information on shelf life and stability of KKG is still lacking. The present study has been planned to conduct long term (real time) shelf life testing , by evaluating the physicochemical parameters of Kesara yukta (with Kesara) Kuṅkumādi Ghṛta (KKG) and Nāgakesara yukta (with Nāgakesara) Kuṅkumādi Ghṛta (NKG) at 0, 3, 6, 9 and 16 months. The raw material was procured in coarse form from the Pharmacy, of the Institute and authenticated by Pharmacognosy laboratory. The crude drugs used in KKG preparationwith their botanical identities and quantities are listed in [Table 1]. The study was carried out between January 2007 – December 2008. The whole pharmaceutical procedure is arranged in the following two unit processes: (1) Mūrcchana of Goghṛta (ghee of Indian cow- Bos Primigenius Indicus)and (2) Preparation of KKG from Mūrcchita Ghṛta. Mūrcchana was carried out as pretreatment of Ghṛta, before main process of KKGpreparation. Both Mūrcchita Ghṛta. and KKG were prepared by adopting Ayurvedic classical guidelines. The standard manufacturing procedure for preparation of Mūrcchita Ghṛta and KKG was established and maintained for future reference. Total 3 batches of KKG and NKG eachwere prepared by adopting classical method, and average results obtained during preparation are briefly presented in [Table 2]. The storage conditions applied were temperature 40°C ± 2°C and relative humidity 75 ± 5%. Go Ghṛta, Mūrcchita Ghṛta, KKG and NKGwere analyzed by employing various analytical parameters. Comparative differences in organoleptic characters (colour, odour, taste, touch) and values of physicochemical parameters such as ash value, pH value, total solid content, specific gravity at 40°C, refractive index, loss on drying at 110°C, acid value, Iodine value (Wij's method), saponification value, unsaponifiable value, peroxide value and Rancidity test (Kries test), of raw materials (herbal ingredients, Go Ghṛta, Mūrcchita Ghṛta) as well as finished products (prepared KKG and NKG) were evaluated. Long term (real time) shelf life study was carried out at the intervals i.e., at 0, 3, 6, 9 and 16 months. The samples subjected for chromatographic separation were as follows - 1: Unsaponifiable matter of Go Ghṛta, 2: Unsaponifiable matter of Mūrcchita Ghṛta, 3: Unsaponifiable matter of KKG, 4: Unsaponifiable matter of NKG, 5: Methanolic extract of crude Kesara, 6: Methanolic extract of KKG, 7: Methanolic extract of NKG. Initially sample solutions were prepared. The mobile phase used was a mixture of Petroleum Ether and Diethyl Ether in the ratio 70:30. Detection was carried out using Vanillin sulphuric acid. The plate was visualized under long UV and daylight radiation and density of the separated spots was recorded using scanner III. The Rf value of all the tracks were recorded and presented respectively [Figure 1]. The concepts of maturity of herbs, standard preparation methods, quality of final product and its mode of usage in a logical manner are highly emphasized in Ayurveda.,,, Initially the raw materials were authenticated and analyzed before processing as the good quality products mainly depend upon genuine raw materials. Go Ghṛta was used, as it is said to be best among all lipids to prepare Ghṛta preparations, and it possess Saṃskārānuvartana (the quality of a substance which when added with another substances does not change its original property and also improves the quality of added substances) and other highly nourishing properties.Ghṛta Mūrcchana and subsequent Ghṛta Pāka (main cooking procedure of Ghṛta) was carried out by following classical reference.Mūrcchana helps in refinement of Ghṛta, and is aimed at removing un-dissolved solids, moisture content/factor causing rancidity (Āma doṣa), undesirable odour (Gandha doṣa), free fatty acids, phosphatides etc., in the crude Ghṛta, which may alter its physico-chemical characters., The process as per Ayurvedic texts potentiates the Ghṛta, induces antioxidant properties, inhibits lipid-peroxidation, makes it lighter for digestion and greatly improves drug absorbability, assimilability and shelf life.,, Comparative clinical data on Mūrcchita and Amūrcchita samples are required to establish the claims about Mūrcchana. Average loss in final product was 10.18% in KKG and 7.58% in NKG. 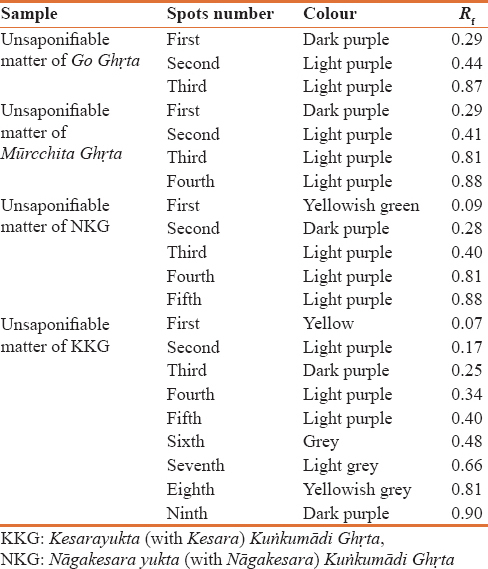 Organoleptic characters were documented at two stages of preparation [for Mūrcchita Ghṛta, and KKG and NKG], [Table 3] because these parameters can change at different stages. Significant difference was found in color of finally prepared KKG and NKG (dark orange and dark yellow respectively). Prior to subjecting Kesara to pharmaceutical processing, few tests were conducted [Table 4] for determination of adulteration/exhausted sample (viz. H2 SO4 test, loss on drying, microscopy, and colour test). Kesara which was used in KKG was found to not be adulterated nor exhausted and to be of adequate quality. [Table 5] shows that the inorganic content and moisture content levels present in the raw materials comply with official standards. The comparative physicochemical values of different samples viz. Go Ghṛta, Mūrcchita Ghṛta as well as finished products (KKG and NKG) at 0, 3, 6, 9 and 16 months have been presented in [Table 6] and [Table 7]. [Table 6] reveals that Mūrcchita Ghṛta has higher specific gravity in comparison to plain Go Ghṛta. This may be due to solid extractives in Ghṛta from the herbals added during the Mūrcchana process. Specific gravity and refractive index remained unchanged for both samples during 16 months. It indicates that no drastic changes occur to the Ghṛta and Mūrcchita Ghṛta even after 16 months. Acid value is defined as the number of milligrams of potassium hydroxide required to neutralize the free fatty acids present in 1 g of sample of Ghṛta, while saponification value is the number of milligrams of potassium hydroxide required to neutralize the fatty acids results from complete hydrolysis of 1 g of sample of Ghṛta. Generally, rancidity causes free fatty acid liberation; hence acid value and saponification value are used as indications of rancid state. Thus, more the saponification and acid value, more will be the rancidity factor and less will be the shelf life and therapeutic value. In the present study, their values were found lesser in Mūrcchita Ghṛta than plain Go Ghṛta. The herbal ingredients used during the Mūrcchana process may be playing a significant role in decreasing the saponification value and acid value in Mūrcchita Ghṛta. These may also cause increase in the therapeutic values by adding many water soluble and fat soluble extractives to the initial Ghṛta. Heating or boiling the oil is also an ancillary part which may cause decreasing of the rancidity factors because heating by itself causes the evaporation of moisture. Ultimately Mūrcchana process reduces degree of saturation of oils and enhances degree of unsaturated fat which is beneficial for human health. Hence the medicated Ghṛta should be prepared by taking the Mūrcchita Ghṛta as base, rather than crude Ghṛta. Loss on drying suggests moisture contents were slightly increased after 9 months in both samples. The Iodine value of an oil or fat is the weight of Iodine absorbed by 100 parts by weight of the sample. It indicates the degree of unsaturated fat. Greater degree of unsaturation indicates the possibility of the oil becoming rancid due to atmospheric oxidation. But the degree of changes was not pronouncedly more in Ghṛta and Mūrcchita Ghṛta after various time intervals. Peroxide value, which is responsible for rancidity, is the number of milli equivalents of active oxygen that expresses the amount of peroxide contained in 100 g of the substance. At 0 month it was 0 for Ghṛta and 1.99 for Mūrcchita Ghṛta. But for Mūrcchita Ghṛta, it increased more rapidly than Ghṛta. Un-saponifiable matter is the matter present in oil which after saponification and extraction with an organic solvent remains non volatile on drying at 80°C. The un-saponifiable matter includes hydrocarbons, higher alcohols, sterols, mineral oil etc., Most oils contain less than 2% of un-saponifiable matter. At 0 month, in both samples it was less than 2%. Oils and fat with higher degree of unsaturation pick up the oxidative rancidity earlier. Volatile products are those which are produced by complex chemical changes due to high peroxide levels and are responsible for rancid taste and odor. After 16 months and after 9 months rancidity test was negative for Go Ghṛta and Mūrcchita Ghṛta respectively. No organoleptic changes were found in Go Ghṛta and Mūrcchita Ghṛta after 16 months. The values of parameters of both samples showed no specific difference or rapid changes towards Rancidity. The findings suggest that the Shelf life of Go Ghṛta and Mūrcchita Ghṛta is more than 16 months. [Table 7] shows that both KKG and NKG had <1% loss on drying at 110°C value (at 0 month), indicating meager moisture content in the samples. In conjunction with a suitable temperature, moisture may lead to the activation of enzymes and given suitable conditions, lead to the proliferation of living organisms. Hence, moisture contents may affect the quality and hence the shelf life of the drug. The results obtained suggest that the samples had been prepared properly till the Siddhi Lakṣaṅas (confirmative signs of process completion), were observed. The shelf life of the sample is enhanced if there is absence or very little moisture content in the sample. Loss on drying was found <1% up to 6 months in both samples. No significant difference was found in specific gravity and refractive index during 16 months in both samples. Changes found in loss on drying, saponification value and peroxide value were almost parallel in both samples during 16 months. Slightly higher changes were found in acid value and iodine value but they were negligible. Unsaponifiable matter of both samples was almost same at 0 month (i.e., 1.0921 for KKG and 1.1281 for NKG). No significant difference was found for any parameter between both KKG and NKG after 16 months, though organoleptic character - colour was different. Rancidity test was also found negative for both samples. The findings suggest the shelf life of both KKG and NKG to be more than 16 months. At 20th month KKG and NKG showed positive rancidity test, which indicates that their deterioration might have started after 16 months. These findings can validate the Ayurvedic principles that stipulate Ghṛtas to have shelf life of 16 months. It is also evident from results that comparatively lesser iodine value, acid value and saponification value was found in KKG than NKG (at 0 to 16 months), which suggest more stability of the former. Chromatographic study showed 3 spots in Go Ghṛta, 4 spots in Mūrcchita Ghṛta, 5 spots in NKG and 9 spots in KKG [Table 8]. In Mūrcchita Ghṛta, 3rd spot (light purple) at 0.81 Rf value was different from Go Ghṛta. In KKG, 2nd spot (light purple) at 0.17 Rf value, 4th (light purple) at 0.34 Rf value, 6th spot (grey) at 0.48 Rf value and 7th spot (light grey) at 0.66 Rf value were different that of NKG. Methanol extract of Kesara, KKG and NKG didn't show spots with same solvent and detector. TLC of KKG differs from NKG and present findings could be useful to check the adulterated market samples of Kuṅkumādi Ghṛta. The present study is a preliminary attempt to analyze thoroughly the Ayurvedic Principles of shelf life of medicated Ghṛta. The present paper has developed physicochemical profile of KKG to estimate its shelf life at various time intervals. However more extensive studies are needed to evaluate the qualitative and chromatographic profile of the formulation, to ascertain the quality of both formulations KKG and NKG, and their comparative biological roles. The present study establishes the physicochemical profile of KKG and concludes that the shelf life of MG, KKG and NKG to be 16 months. After 16 months, Go Ghṛta showed negative rancidity test, while MG, KKG and NKG showed positive rancidity, indicative of onset of deterioration after 16 months. Present findings validate the Ayurvedic principles that stipulate Ghṛtas to have shelf life of 16 months. It is also evident from obtained results (at 0 to 16 months) that KKG has comparatively lesser iodine value, acid value and saponification value than NKG, thus KKG is probably more stable than NKG. 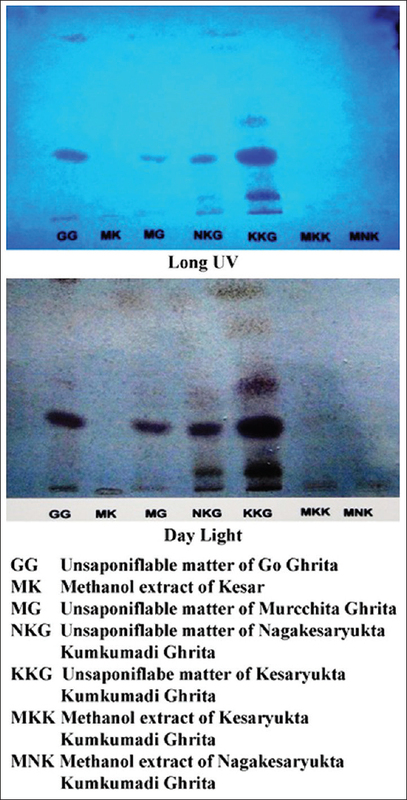 Chromatographic study showed few differences between KKG and NKG samples. Data obtained by present study may be considered as standards for future researches. IPGT and RA, Gujarat Ayurved University, Jamnagar. Mishra S, editor. Kshudra rogadhikar. Bhaishajya Ratnavali of Govind Das Sen. Reprint Edition. Ch. 60, Ver. 103-105. Varanasi: Chaukhamba Surbharti Prakashan; 2012. p. 942. Available from: http://www.en.wikipedia.org/wiki/Saffron. [Last accessed on 2014 Oct 05]. Gresta F, Lombardo GM, Siracusa L, Ruberto G. Saffron, an alternative crop for sustainable agricultural systems – A review. Agron Sustainable Dev 2008;28:95-112. Srivastava TN, Rajasekharan S, Badola DP, Shah DC. Important medicinal plants of Jammu and Kashmir I. Kesar (saffron) Anc Sci Life 1985;5:68-73. Acharya YT, editor. Chikitsa Sthana, Niruhkramchikitsa Adhyaya. Sushruta Samhita of Sushruta. Reprint Edition. Ch. 38, Ver. 52. Varanasi: Chaukhambha Surbharati Prakashan; 2012. p. 543. Acharya YT, editor. Sushruta Samhita of Sushruta. Uttara Tantra, Unmaadpratishedh adhyaya. Reprint Edition. Ch. 62, Ver. 24. Varanasi: Chaukhambha Surbharati Prakashan; 2012. p. 805. Dholakiya MV, Vachharajani YR, Shah DC, Bahadur MV, De S. Study of Dadimadi Ghrat. J Res Ayu Siddha 1992;13:169-73. Shaila D, Santosh MK, Chandrakumar T, Rao LS. Standardization study of Ghritas. EJ Chem 2004;1:151-7. Hiremath SG. Sneha Kalpana. A Text Book of Bhaishajya Kalpana. 2nd Revised Edition. Ch. 22, Part 1. Varanasi: Chaukhamba Orientalia; 2005. p. 243. Gupta A, Jaiswal M, Prajapati PK. Shelf life of Ayurvedic dosage forms – Traditional view, current status and prospective need. Indian J Tradit Knowl 2011;10:672-7. Prajapati PK, Amrutia A, Sharma R, Patgiri BJ. Clinical efficacy of Kumkumadi Ghrita prepared by Kesar and Nagakesar on Mukhadushika (Acne vulgaris). Int J Pharm Sci Res 2014;5:806-11. Prajapati PK, Amrutia A, Sharma R, Patgiri BJ. Standard manufacturing procedure (SMP) of Kumkumadi Ghrita: An Ayurvedic formulation. World J Pharm Res 2014;3:1-13. Remigton JP. The Science and Practice of Pharmacy. Vol. 1, Ch. 52. New Delhi: B. I. Publication Pvt. Ltd.; 2006. p. 1025. Available from: http://www.ich.org/fileadmin/Public_Web_Site/ABOUT_ICH/Organisation/SADC/Guideline_for_Stability_Studies.pdf. [Last accessed on 2016 Feb 24; 11:36]. Bajaj S, Singla D, Sakhuja N. Stability testing of pharmaceutical products. J Appl Pharm Sci 2012;2:129-38. Mishra S, editor. Jvaradhikara. Bhaishajya Ratnavali of Govind Das Sen. Reprint Edition. Ch. 5, Ver. 1266-1267. Varanasi: Chaukhamba Surbharti Prakashan; 2012. p. 206. Shastri P, editor. Madhyama Khanda. Sharangadhara Samhita of Sharangadhara. 7th ed., Ch. 9, Ver. 2-14. Varanasi: Chaukhamba Orientalia Prakashan; 2006. p. 432. Lawless HT, Heymann H. Sensory Evaluation of Food, Principles and Practices. 2nd ed. New York: Springer Science + Business Media LLC; 2010. p. 326. Indian Pharmacopoeia. Government of India, Ministry of Health and Family Welfare. Appendix – 3.38:A-54. New Delhi: Controller of Publications; 1996. p. 2. Anonymus. The Ayurvedic Pharmacopoeia of India. 1st ed., Vol. 1, Part 1. New Delhi: Ministry of Health and Family Welfare, Government of India; 1999. p. 214 (2.2.9). Anonymus. The Ayurvedic Pharmacopoeia of India. 1st ed., Vol. 1, Part 1. New Delhi: Ministry of Health and Family Welfare, Government of India; 1999.p. 236 (3.7). Indian Pharmacopoeia. Government of India, Ministry of Health and Family Welfare. Appendix – 8.1:A-95. New Delhi: Controller of Publications; 1996. p. 2. Alam M, Natarajan M, Shanmughadasan KK, Varadharajan TV, Purushothaman KK. Standardisation of Sukumara ghrita. J Res Ayu Siddha 1981;2:264-73. Anonymus. The Ayurvedic Pharmacopoeia of India. 1st ed., Vol. 1, Part 1. New Delhi: Ministry of Health and Family Welfare, Government of India; 1999. p. 209-13 (3.10-3.16). Sharma R, Amin H, Galib R, Prajapati PK. Seasonal variations in physicochemical profile of Guduchi satva (starchy substance from Tinospora cordifolia [Willd.] Miers). J Ayurveda Integr Med 2013;4:193-7. Sharma R, Amin H, Galib R, Prajapati PK Validation of standard manufacturing procedure of Guduci sattva (aqueous extract of Tinospora cordifolia (Willd.) Miers) and its tablets. Anc Sci Life 2013;33:27-34. Acharya YT, editor. Charaka Samhita of Agnivesha, Sutra Sthana. Reprint Edition. Ch. 13, Ver. 13-14. Varanasi: Chaukhambha Orientalia; 2004. p. 178. Angadi R. The concept of Sneha Murcchana. A Text Book of Bhaishajya Kalpana Vijnana. Reprint Edition. Ch. 28, Part 1. Varanasi: Chaukhamba Surbharati Prakashan; 2011. p. 227. Rai P. Concept of taila Kalpana in ayurvedic pharmaceutics – A critical review. Unique J Ayurvedic Herbal Med 2015;3:79-81. Rai P. Importance of Murchhana samskara in the preparation of medicated oil – An analytical study. Int J Ayu Pharm Chem 2015;3:180-6. Zala U. A Comparative Pharmaceutico-Pharmaco-Clinical Study of Different Samples of Panchatikta Ghritawith its effect on Ekakushtha. MD Dissertation. Jamnagar: I.P.G.T. and R.A, Gujarat Ayurved University; 2004. Vaghamshi R, Jaiswal M, Prajapati PK, Patgiri BJ. A comparative pharmaceutical standardization of Taila and Ghrita preparations of Guduchi (Tinospora cordifolia). AYU 2009;30:34-41. Patgiri BJ, Krishnamurhty MS, De S, Singh K. A comparative pharmaceutico-chemical study of 1,7 & 50 Avartita Ksheer Bala Taila. AYU 2008;29:110-8. Available from: http://www.fao.org/ag/agn/jecfa-additives/specs/Monograph 1/Additive-381.pdf. [Last accessed on 2016 Feb 23]. Hiremath BS, Hiremath VV, Mohapatra S, Sarashetti RS. Effect of Murchhana samskara in the preparation of Hingutriguna Taila – An analytical study. Biomed Pharmacol J 2013;6:371-4. Deshpande S, Deshpande A, Tupkari S, Agnihotri A. Shata-dhauta-ghrita – A case study. Indian J Tradit Knowl 2009;8:387-91. Acharya YT, editor. Kalpa Sthana. Charaka Samhita of Agnivesha. Reprint Edition. Ch. 12, Ver. 103. Varanasi: Chaukhambha Orientalia; 2004. p. 645.